Farming seems to be seeding a robotic future. Including the work done by HFH, nearly every element of farming can be handled by robots, even detecting diseases and killing weeds. 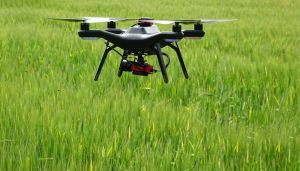 And it’s not just crops that are seeing automated agriculture. Chinese farmers have implemented automation and artificial intelligence to keep track of pigs and monitor their health as well as their overall well being. There’s also Aspire, which uses a robotic system to raise crickets that will be used to make mainstream, protein-filled snacks. If HFH’s work is anything to go by, though, time of day and weather are still factors automation isn’t fully prepared for; for example, when raining, the automated tractor would slip and have a hard time maintaining a straight line. It’s unclear when, exactly, we’ll see more farms transition to automation here in the U.S. Yet we should expect it to happen in the near future, as companies like John Deere invest in other companies that specialize in applying automation to agriculture. Cricket-farming Aspire also operates out of the United States, and it’s possible their success will inspire others to turn to automated agriculture to raise animals and crops for food.